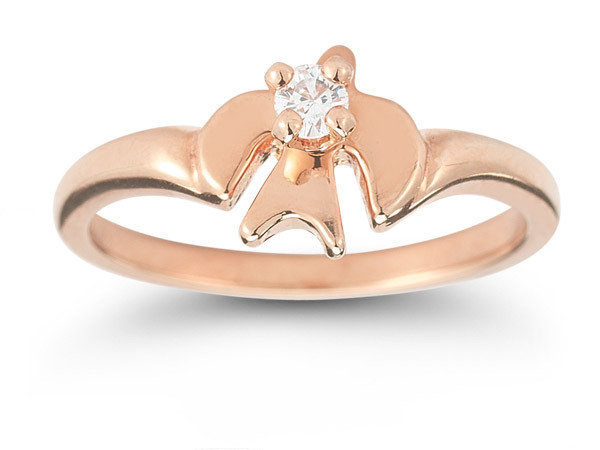 The charm and quaint qualities of rose gold are amplified in this stunning Holy Spirit Dove Diamond Ring from Apples of Gold. This piece exemplifies beauty with a carefully carved dove that marks the center of the ring. Forged of glowing 14K rose gold, the dove is also home to a round cut, white diamond. With the centerpiece sparkling at every angle, the rose gold is then molded into a seamless, beautiful band, completing the design for this inspiring ring. Apples of Gold Jewelry guarantees the Holy Spirit Dove Diamond Ring in 14K Rose Gold to be of high quality and an authentic engagement ring with real diamonds, as described above.